April 26th, 2016 | Moving Tips, Packing Tips. Moving is a stressful experience, and it’s even more so if you’re on a budget. Here are six essential tricks for moving while also saving money. A smart move starts months before the physical moving. Start collecting packing materials long before you leave. You can collect boxes from presents, online purchases, or office orders at work. When you finally do start packing, use clothes, towels, and other soft materials you already have to protect your fragile belongings. Make sure that the things you’ll need sooner are easy to find and retrieve. Doing so will help you avoid frantic, last-minute searches. A move is the perfect opportunity to declutter your life. Get rid of what you can to help you start fresh. 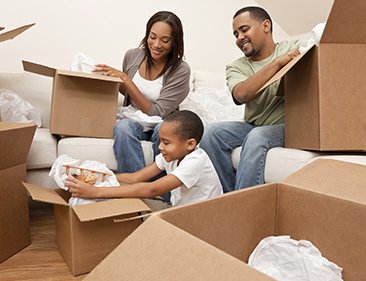 Additionally, moving with a lighter load can save you money. Weight is a common way for professional movers to determine the cost. So why not take it a step further and sell your old belongings? Whether you use online listings or hold a garage sale, make a few extra bucks by selling everything from old t-shirts to unneeded furniture. At the end of the sale, take the leftovers to the thrift store and donate them. Ask for a receipt and get a break on next year’s taxes. If your new home is close by, you can probably move the milk from one place to another without any problem. However, if your move is a long distance move, you’ll have to restock perishables when you arrive. Depending on the size and nature of your move, as well as how much stuff you get rid of, you may have some larger items you need to replace as well. Plan and budget for these replacements so that you’re not stuck looking at a new couch only to realize you don’t have the money for it. For some items, like that couch, make a stop at your local thrift store and buy a couch that’s already broken in. Many people’s first instinct when trying to save money on a move is to steer clear of professional movers. However, hiring professional movers may actually be cheaper than trying to move on your own. Not only will the move be faster and more efficient, but your belongings will also be better taken care of so you don’t have to spend money on repairs or replacements. When you move yourself, you have to get help from friends and family, which might require paying to feed them. You also need to rent a truck to drive, which presents its own set of potential problems. You have to pay for the gas, and you may stress over driving a vehicle much larger than you’re used to. Additionally, the chances of needed maintenance on the road increase the longer the trip. When you’re working on shutting off your old home’s utilities and turning them on for your new home, plan for the costs. Some utilities may require a deposit, depending on your credit score (which you’ll want to budget for). Some utility companies also won’t prorate your bill, so consider shutting utilities off early to eliminate the extra cost. You won’t be able to do this for water or electric, but you can go a week or two without cable. We all know the saying, “time is money.” Plan your move wisely so that you don’t have to take too much time off work. If at all possible, move on a student’s schedule. Various rent, cable, and internet deals may coincide with the start of the school year. Professional movers will also have more tips to help you save even more money, so don’t be afraid to ask.